In November 2008, I confirmed that I was a descendant of royalty. To be honest, just about everyone goes back to royal lineage, if you go back far enough. (It's a numbers game. We have an astronomical number of ancestors who lived, say, 1,000 years ago.) But finding confirmation is another matter. 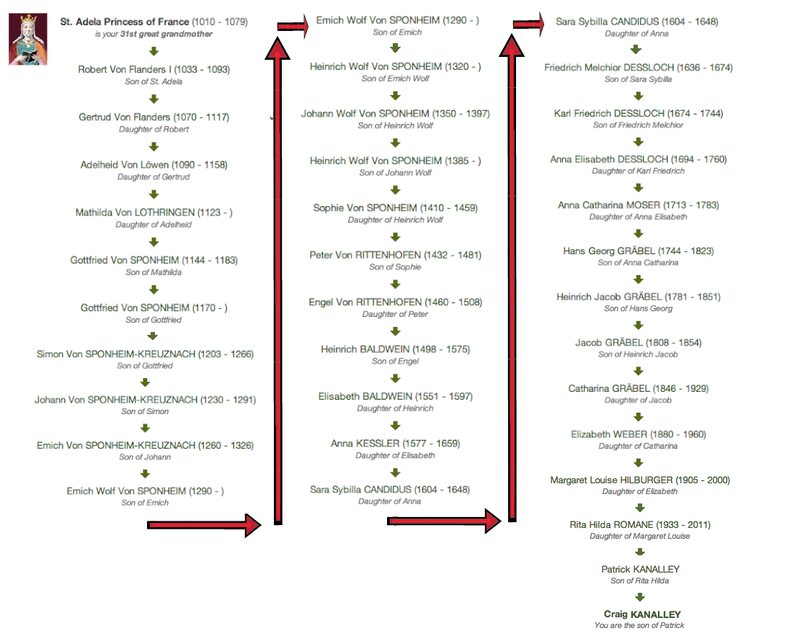 So as a genealogy enthusiast, I was delighted to make that discovery. 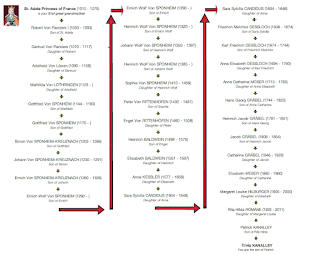 Tonight, four years and a few months later, I was browsing the Internet to learn more about these royal lines, and I discovered that one of my ancestors was a Catholic saint. St. Adela (princess of France, countess of Flanders) was born about 1010 in France, the daughter of Robert II, King of the Franks, and Constance Arles de Toulouse. In 1027 she married her first husband Richard III, Duke of Normandy. He died shortly after and they had no children. She married again in 1028 Baldwin V, Count of Flanders, and they had my ancestor Robert I of Flanders. After her second husband died, she became a nun. She helped establish Catholic educational institutions and monasteries/abbeys, and she died in Mesen, Belgium in 1079 where she is buried. There's an interesting piece about her here, written by someone who visited Mesen, Belgium. According to her Wikipedia page, she was known most commonly as Adèle of France, Adela of Flanders, Adela the Holy or Adela of Messines. Other forms of her name are Adélaïde, Adelheid, Aelis and Alix. Here's her Catholic Saint page. My relationship to St. Adela can be seen in the chart below. Click to enlarge. 1 comments on "My 31st Great-Grandmother, St. Adela"